We've been impressed with Tyent's signature "ease of use" and easy to navigate advanced user controls and we were not disappointed with the performance and usability of the Tyent MMP-Turbo 7070 water ionizer. With up to 285 watts of power and 7 large hybrid mesh electrodes, this model produces some of the strongest pH levels of any water ionizer on the market today and has many advanced features. 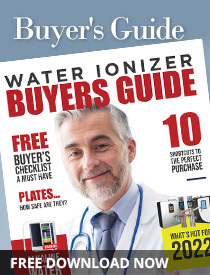 If you choose the Turbo 7070 water ionizer you'll have one of the most fully adjustable water ionizers on the market. Users can customize every primary alkaline and acidic preset based on source water conditions and personal use preferences. The advanced settings controls are easy to navigate with both audio and visual alerts confirming your selections. At the highest setting, Tyent's Turbo 7070 operates at 285 watts of power. This gives more users in more areas the power they need to produce the strongest levels of ionized alkaline and acidic water. Day to day operation is easy and convenient. True "one-touch" operation means that by simply touching the control panel icon for the level of water you want to produce starts the Turbo 7070's operation at that level. Switching between the different available pH levels can also be done with another single touch on the control panel. No toggling through different levels to get where you want to go - no need to turn the unit off and then select the next level you want to use. If you seen the visual alert but have no need to get water for yourself you can touch the RTR icon on the control panel and walk away - you will need to make sure that water is being supplied to the unit. If you go to the unit to get water and see the visual alert for the cleaning cycle, simply touch the control panel icon for the level of water you want to produce. The cleaning cycle will run and once it has completed the unit will begin producing water at the level you selected. In addition to the automated cleaning cycle, the Turbo 7070 has an available cleaning cartridge to remove excess scale buildup that occurs over time. Tyent recommends running a cleaning cartridge once every 6 to 9 months in areas with very hard water or once every 12 - 18 months in other areas. Regardless of a water ionizer's automated cleaning cycle, performing a cleaning using a cleaning cartridge or other cleaning protocol that does NOT involve the electrolysis function of the water ionizer is the only way to effectively remove scale buildup from the plates inside the electrolysis chamber. Other important features include automated flow control and automated shut off. If the Tyent Turbo 7070 senses that water is not flowing to the unit or if the flow rate is too low, the unit will stop trying to produce water and give an audio alert letting you know that there is a water supply/water flow issue. This will prevent damage to the electrodes. Should the unit be left running for more than 15 minutes, it makes the assumption that it has been left unattended and will automatically stop production. This prevents overflow and unnecessary wear and tear on the unit. You can restart the unit at any time by simply touching the control panel icon for the level of water you want to continue producing. Definitely an attractive unit, but without the stainless steel front panel or choice of black or white casing you get with the 9090 Turbo Extreme model. The Turbo 7070 has a clean white case with silver front panel. Sleek, slim and at less than 5 inches deep will leave you with plenty of usable counter space in front of the unit. This Tyent model has a dual internal filtration system for removing chlorine, VOC's, heavy metal reduction and many other common contaminants. The secondary filter uses ceramics to address common bacteria and also precondition the water for optimal ionization potential. Tyent backs the Turbo 7070 model with a lifetime warranty covering both parts and labor for as long as you own the unit. All repairs are made in the United States and if our experience contacting technical support by phone is an example of how efficiently their repair facility works, any repair issues should be handled quickly. Tech support was very helpful and patiently answered all of the questions our anonymous caller asked. Having a tech support person that seems to enjoy working with the machines really makes a difference when you call with questions. Advanced Features Fully adjustable presets, automated timed shutoff to prevent overflow, one-touch operation, intuitive advanced settings mode for ease of customization. Warranty LIfetime warranty covering both parts and labor for as long as you own the product.